Raja Chaudhary is well known as trouble maker as he always creates havoc and troubles for its co-stars. He has been caught in a number of brawls, may be he loves to remain in limelight for all the wrong reasons. He is currently seen on Sahara One's ‘Kahani Chandrakanta Ki’ as Bhavani Singh. 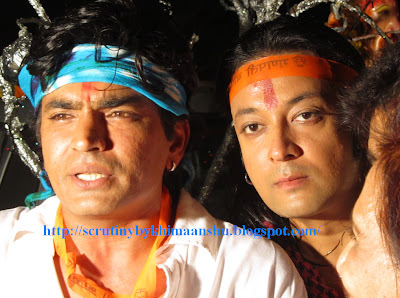 As reported earlier he had a major fight with Santosh Shukla, which made the entire unit and cast uncomfortable. Santosh plays the character of Virendra Singh and is lead actor of the show. Raja and Santosh have not got along well from last few days because they have problems in sharing the same makeup room. The duos have had few hit and misses scenes, but have not come face to face till now in the show. Santosh was getting his makeup done and had to step out to answer an urgent call. On returning, he found Raja sitting in his place for makeup. As Santosh's scene was before his, he requested Raja to get ready later. To which Raja exploded on him and as a result the argument turned physical. Sunil Agnihotri was unavailable for comment. Well I guess consciously or unconsciously, this is another round of publicity. Dimply Mahajan to add pinch of Salt and spice up ‘Kahani Chandrakanta Ki’!! Santosh Shukla approached for Bigg Boss 5? Chandrakanta press conference at Grand Maratha!